Archery target nets, also known as backstop netting, are designed to stop airborne arrows from straying out of the target area. No backstop target net can guarantee to stop all arrows however it is a secondary line of defence when considering range and target safety. This net should not be relied upon as your only safety precaution in place. Our archery target net is for use only with lightweight non-competition arrows and would be ideally suited to school and scout groups, amateur events such as fetes or shows and for use within your back garden. For these events the archery target net is ideal and invaluable. Our Archery target netting is made from close woven high quality polypropylene fitted with eyelets that are situated along the top of the net, the remaining edges are reinforced for added strength. We are able to tailor the size to your requirements; however we would recommend a maximum width of 4 metres. If more than one net is going to be installed, we recommend an overlap of 50cm. 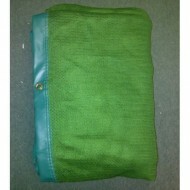 For more intensive use, two layers of netting can be installed. The nets should be left slack like a curtain and not placed under tension. 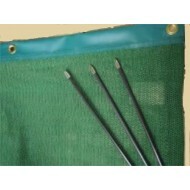 Archery target nets, also known as backstop netting, are designed to stop airborne arrows from stray..